Weather is defined as the state of the atmosphere at a given time and place, with respect to variables such as temperature, moisture, wind velocity, and barometric pressure. Weather and climate describe the world outside the window - whether it’s hot or cold, humid or dry, sunny or cloudy. Weather is the short term conditions present in the moment that let people know what to wear today and whether or not to bring an umbrella. Climate describes the long term conditions that let people know what clothes to keep in their wardrobe all year long and whether they need to own snow boots, flip flops or both. These and many other factors, including greenhouse gases in the atmosphere, combine to form the high and low pressure systems you hear about on the weather report, and over time add up to the climate of the location you live in. To understand the complex interactions and patterns of weather and climate, scientists collect as much observational data as they can on precipitation, temperatures, humidity, and other atmospheric conditions. They then use that data and the relationships between the different pieces to create computer models of local, regional, or even global weather and climate. Weather reflects short-term conditions of the atmosphere while climate is the average daily weather for an extended period of time at a certain location. In other words, climate is what you expect, weather is what you get. Weather is what you see outside on any particular day. So, for example, it may be 75° degrees and sunny or it could be 20° degrees with heavy snow. That’s the weather. Climate is the average of that weather. For example, you can expect snow in the Northeast in January or for it to be hot and humid in the Southeast in July. This is climate. The climate record also includes extreme values such as record high temperatures or record amounts of rainfall. If you’ve ever heard your local weather person say “today we hit a record high for this day,” he is talking about climate records. So when we are talking about climate change, we are talking about changes in long-term averages of daily weather. In most places, weather can change from minute-to-minute, hour-to-hour, day-to-day, and season-to-season. Climate, however, is the average of weather over time and space. Depending on their type, clouds can consist of dry air mixed with liquid water drops, ice particles, or both. Low, shallow clouds are mostly made of water droplets of various sizes. Thin, upper level clouds (cirrus) are made of tiny ice particles. Deep thunderstorm clouds which can reach up to 20 km in height contain both liquid and ice in the form of cloud and raindrops, cloud ice, snow, graupel and hail. It is important to understand that even a cloud that looks impenetrably dark is almost entirely made of dry air. Water vapor and precipitation each make up a maximum of just a couple of percent of the mass of a cloud, except in a few very intense storms. In meteorology, precipitation (also known as one of the classes of hydrometeors, which are atmospheric water phenomena) is any product of the condensation of atmospheric water vapor that falls quickly out of a cloud. This is in contrast to cloud water, which is ice or liquid water that falls slowly enough that it can remain in the air for hours. The main forms of precipitation include drizzle, rain, sleet, snow, graupel and hail. It occurs when a local portion of the atmosphere becomes saturated with water vapour and the water condenses. A thunderstorms is a localized storm often accompanied by heavy precipitation and frequent thunder and lightning. A thunderstorm is formed when a combination of moisture and warm air rise in the atmosphere and condense. While over land, thunderstorms are most likely to occur at the warmest, most humid part of the day, which is usually the afternoon or evening. Over the ocean they are most likely to occur in the early hours of the morning before dawn. A hurricane is a type of storm called a tropical cyclone, which forms over tropical or subtropical waters. A tropical cyclone is a rotating low-pressure weather system that has organized thunderstorms but no fronts (a boundary separating two air masses of different densities). Tropical cyclones with maximum sustained surface winds of less than 39 miles per hour (mph) are called tropical depressions. Those with maximum sustained winds of 39 mph or higher are called tropical storms. When a storm's maximum sustained winds reach 74 mph, it is called a hurricane. The Saffir-Simpson Hurricane Wind Scale is a 1 to 5 rating, or category, based on a hurricane's maximum sustained winds. The higher the category, the greater the hurricane's potential for property damage. Hurricanes originate in the Atlantic basin, which includes the Atlantic Ocean, Caribbean Sea, and Gulf of Mexico, the eastern North Pacific Ocean, and, less frequently, the central North Pacific Ocean. "Hurricane Season" begins on June 1 and ends on November 30, although hurricanes can, and have, occurred outside of this time frame. They occur, on average, 12 times a year in the Atlantic basin. A six-year rotating list of names, updated and maintained by the World Meteorological Organization, is used to identify these storms. A waterspout is a whirling column of air and water mist. 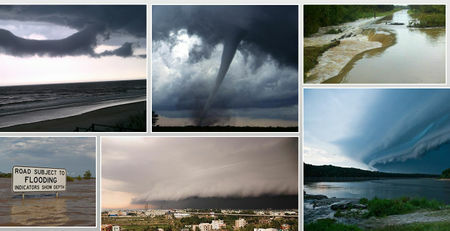 Waterspouts fall into two categories: fair weather waterspouts and tornadic waterspouts. El Niño and La Niña are complex weather patterns resulting from variations in ocean temperatures in the Equatorial Pacific. El Niño and La Niña are opposite phases of what is known as the El Niño-Southern Oscillation (ENSO) cycle. The ENSO cycle is a scientific term that describes the fluctuations in temperature between the ocean and atmosphere in the east-central Equatorial Pacific (approximately between the International Date Line and 120 degrees West). La Niña is sometimes referred to as the cold phase of ENSO and El Niño as the warm phase of ENSO. These deviations from normal surface temperatures can have large-scale impacts not only on ocean processes, but also on global weather and climate. El Niño and La Niña episodes typically last nine to 12 months, but some prolonged events may last for years. While their frequency can be quite irregular, El Niño and La Niña events occur on average every two to seven years. Typically, El Niño occurs more frequently than La Niña. La Niña means The Little Girl in Spanish. La Niña is also sometimes called El Viejo, anti-El Niño, or simply "a cold event". ↑ Weather American Heritage® Dictionary of the English Language. Accessed January 26, 2015. ↑ 2.0 2.1 2.2 Weather & Climate NASA: Goddard Space Flight Center. Accessed January 26, 2016. ↑ 3.0 3.1 3.2 What is the difference between weather and climate? National Oceanic and Atmospheric Administration. Last Modified April 07, 2014. ↑ 4.0 4.1 The Water Cycle NASA: Goddard Space Flight Center. Accessed January 26, 2016. ↑ 5.0 5.1 5.2 What are clouds made of? Are they more likely to form in polluted air or in pristine air? NASA: Goddard Space Flight Center. Accessed January 26, 2016. ↑ Glossary: Precipitation NASA: Goddard Space Flight Center. Accessed January 26, 2016. ↑ Glossary: Thunderstorm NASA: Goddard Space Flight Center. Accessed January 26, 2016. ↑ Is there a specific time of day that a thunderstorm is most likely to occur? NASA: Goddard Space Flight Center. Accessed January 26, 2016. ↑ 11.0 11.1 11.2 11.3 11.4 11.5 11.6 11.7 What are El Niño and La Niña? National Oceanic and Atmospheric Administration. Last Modified January 22, 2016. This page was last modified on 27 January 2016, at 17:24.